Mix 1 part ACV with 1 part water and place together in a spray bottle. You can clean anything from your kitchen sink and counters to your bathrooms. It may seem stinky when first using it, but the smell does dissipate and quickly leaves the room odor-free. Mix together 1 gallon apple cider vinegar with 2 cups epsom salts and ¼ cup dish soap in a spray bottle or large sprayer. Spray over any area that is infested with weeds. This works best on a sunny day. Apply full strength to bug bites to help kill anything that may have entered into the body from the bug, and also to help with the itch. Mix 1 part ACV and 1 part water in a spray bottle; spray on dog or cat and rub into fur and on skin to help keep fleas away. Apply full strength to area with fresh sunburn for about 30 seconds to help minimize the burn. You can also add 1 cup to bath water to help sooth the pain and discomfort, as well as help the body detox. Apply full strength to a new or old bruise to help minimize and fade the blue/purple color, due to the naturally occurring anti-inflammatory properties of ACV. Mix 1 part ACV with 2 parts water and use a cotton ball or facial pad to apply mixture to face. It helps your face look fresh and clean, as well as helping to remove any blemishes, and even acne. Men can also use this as an after shave. REMEMBER: the smell dissipates quickly! Mix 1 tablespoon ACV and 1 cup water, and use as a rinse for your hair after shampooing – your hair will look nice and shiny afterwords. It is also good to use as a de-tangler. Mix 1 part ACV and 1 part water together and swish around in your mouth, or apply ACV directly to teeth with a cotton ball. Please make sure you rinse your mouth out with water after using the rinse or direct application to wash away the acidic residue left on your teeth. Mix 1 part ACV to 1 part water and place in a spray bottle. Use as needed to wash your fruits and veggies to get rid of any pesticide that may be left on the surface, as well as any bug that may be lingering on the skin. Add 1-2 tablespoons when making homemade bone broth. By placing the ACV in the broth, it helps draw the minerals out of the bone, making them readily available when drinking. The following uses for Apple Cider Vinegar can be extremely beneficial if incorporated at the appropriate time in your healing journey. Your body may or may not be ready to use ACV in these ways; please consult with your clinician before using these recommendations. When you are not feeling well and sinuses are congested, try an apple cider vinegar tent. Add ¼ cup of ACV to a bowl of steaming hot water; place your face over the bowl with a towel over your head and the bowl to keep the steam in. Take 12 deep breaths, inhaling the steam with your head under the towel and exhaling out into the air with towel lifted. Replace the towel after each exhale. Take another 12 deep breaths, while exhaling under the tent this time. 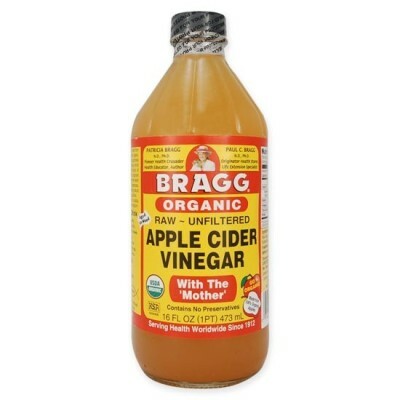 Mix 1 tablespoon ACV with 1 cup warm water and drink to help alleviate heart burn symptoms. Mix 1-2 tablespoons ACV with 1 cup warm water and drink to help with digestion (due to the enzymes in the ACV) as well as detoxification of the liver. It also helps to clear up sinus congestion and allergy symptoms. By mixing about 2 teaspoons (and up to 2 tablespoons) of ACV with 1 cup warm water and a small amount of raw honey and/or some cinnamon, you can give your body of boost of energy naturally. Think of it as a great coffee replacement!! !